On Wednesday the 9th of August, it was a beautiful mild winters day in Melbourne. 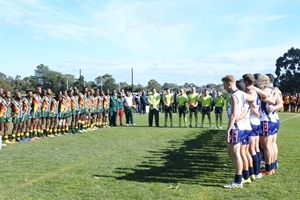 Wesley College in Glen Waverley hosted the Men's Division 1 International Cup match between the South African Lions and USA Revolution. The first quarter of the match started with a lot of hard tackling and neither team were able to break free with possession. Eventually, Revolution gained possession and kicked the footy inside their attacking 50 and Ben Carpenter-Nwanyanwu (#4) kicked truly with a drop punt for Revolution's first goal of the match. It was a tight opening term for both sides, as both teams were ferocious in and around the ball. The Revolution made the most of their limited opportunities inside 50, because they kicked goals when in there. Bryan Dragus (#18) slotted through Revolution's second goal through the big sticks. Each time the Lions kicked the footy in their attacking 50, it was spoiled or intercepted by Revolution's back men. Ben Carpenter-Nwanyanwu (#4) was very mobile up forward. David Restrepo (#14) had another set shot at goal and kicked truly. The Lions struggled to get the ball past the centre and at quarter time Revolution led by 18 points over the Lions. Lions commenced the second term with ferocity in their tackling and Donald Lee (#55) continued to win the hitouts for Revolution. Also the Lions had more inside 50s and all the attacking play this term and were able to kick their first goal of the match via Vuyisille Sokoyi (#1). In the last 5 minutes of this quarter, Revolution stepped up their intensity and as a result kicked another goal through Ben Carpenter-Nwanyanwu (#4) who was presenting well up forward. At the main break the Lions were down by 18 points. The weather became overcast with a cool breeze to start the third quarter. Donald Lee (#15) won the ball from the centre again like he has done all match and kicked the ball to a forward target but the ball was spoiled over the line for a ball up. Revolution went forward and David Restrepo (#14) marked the footy on the 50, he started to line up for goal but in the meantime the Lions gave away a 50 and Revolution kicked the goal from the goal square, the first of the third term. The Revolution had all the ascendency and play in the third and this was reflected on the scoreboard. The Revolution kicked into their attacking half again and as a result one of their players booted Revolution’s sixth goal. The Revolution just kept stepping up their intensity all over the ground and as a result for most of the term they had the ball in their forward half. The Revolution’s seventh goal came after a handball mistake from the Lions opened the door for Michael Murphy (#32) who ran into an open goal. The Lions laid some extremely hard tackles this quarter, but Revolution was still able to gain possession. The Lions had limited shots at goal and unfortunately missed both chances. Bryan Dragus (#18) marked the ball in the forward line for Revolution and kicked another 6 pointer late in the quarter. Revolution had all of the scoring momentum going into the last with a 43 point lead over the Lions. Both teams early in the last quarter struggled to get the ball into their forward 50, as both backlines have held up well. Eventually, the Revolution were able to get the footy to a forward target who just missed the goal. Karabo Marokoane (#18) came off second best in the contest and was in the hands of his trainer while he hobbled to the bench. After the incident, Thimna Bartman (#7) finally slotted the Lions second goal of the match at the 7.45 minute mark of the last. Revolution had not dropped of in intensity in the latter stages of the match and this was shown as Ryan McGettigan (#2) kicked Revolution's ninth goal and the final one of the match. It was a dominant display from Revolution who were victors over the Lions by 47 points. Revolution capitalised everywhere on the ground with great goals, some amazing attacking football and also stood up in their backline. The Lions definitely played better in the second term but were unable to put a halt to Revolution’s fierce attack. At the conclusion of the match, Karabo Marokoane (#18) was on crutches and looked like he has injured his knee.